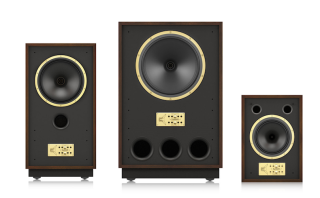 Tannoy reintroduces its Legacy speaker series from the 1970s | What Hi-Fi? If you hark back to the era of flared trousers, Saturday Night Fever and the Ford Capri, Tannoy has just the thing for you. For those wanting to relive the glory days of 1970s hi-fi, the company is bringing back its Arden (middle), Cheviot (left) and Eaton (right) speaker ranges. However, the Devon and Berkeley models from the original five-strong Legacy line-up (pictured below) are not being reintroduced. Like the £17,000 Tannoy Gold Reference GRF, now a permanent addition to the Prestige range, the Legacy models will be built in the company's Coatbridge plant in Scotland. There had been much speculation that the Coatbridge factory would close under its new owners, Music Group - something which the company has since denied. The stand-mount Eaton is the smallest speaker in the revamped range (52 x 35 x 25cm), next up is the Cheviot two-way floorstander (85 x 44 x 26cm) and the largest model is the floorstanding Arden (99 x 66 x 37cm). Sensitivity ratings are 87.5dB, 89dB and 91dB respectively, while power handling ratings are 400W, 500W and 600W. A 10in driver is fitted to the Eaton, the Cheviot gets a 12in unit and the Arden a 15in driver. All three models are equipped with a two-band energy control with boost and attenuation control for fine-tuning the speakers to the listening room they're used in. And they all come with gold-plated, biwireable binding posts. A fifth binding post provides grounding to reduce radio interference and improve midrange clarity. We have asked for confirmation of UK prices and will update this story as soon as we get them. MORE: Tannoy - after 90 years, what does the future hold?